Bess is gong well and is sound in walk trot and canter! She even enjoys a bit of jumping. She is back to her old self! Thank you so much for everyone who helped to fund raise for Bess as she has made an unbelievable recovery! It has been over a year since Bess' accident and, fingers crossed, she is doing really well! She is now out in the field with all her friends and frequently likes to test out her new foot by galloping, rearing and bucking. 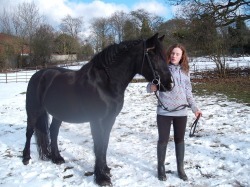 She is starting ridden work again but due to long periods on box rest and the wet winter she had been suffering from thrush and chipped hooves so is not doing anyhting too strenuous at the moment. Bess is out in the field! 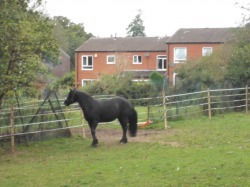 After our tidy up day at the weekend we had a small field which was cleared ready for her to go out. She has to have a field on her own at the moment to stop her running round with her friends as she is still a bit wobbly on her 'new' foot. 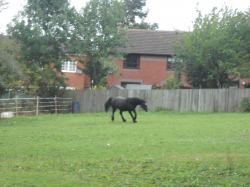 She was let out in the afternoon and after a little trot and canter round she settled to graze. Her foot was hurting a bit after she had run round but she seemed very happy. She came in for the night because the flies were bad but she will be going out each day now to graze and to get some exercise. This is the first time since her accident that she has been out and it was lovely to see her enjoying some freedom again. Bess lookes over at the other horses. Bess is still on box rest and her foot is getting better all the time. She is walking well on it when she is walked out of her stable. 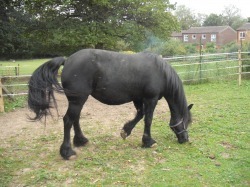 She is due an x-ray soon and when this is done she should be able to be let out to grass for the rest of her recovery. She has been very patient but she can't wait to be out of her stable and have her freedom back. Bess arrived home in the horse ambulance today. She was delighted to be back and to see all her friends- they were very pleased to see her too. She is to be on box rest now for two months and then after this more x-rays must be taken to see how well the bone has healed. It is a great relief to have Bess back at our stables and we must say a huge thankyou to all who helped us to get her back here! Today I spoke to the vet who operated on Bess. He was very pleased with her progress and says that although she is more sore on her foot since they took the cast off this is to be expected. He is very pleased with the outcome of the operation and thinks the result was as good as can be expected. There is obviously a lot of healing time to go but Bess may be home in the near future where she will be able to complete the rest of her recovery surrounded by her friends. 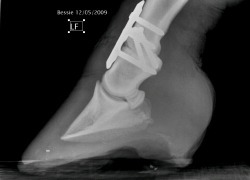 The screws in her foot are holding the joint, that was dislocated and broken, back together. Luckily this joint is not her fetlock (ankle) which needs to move a lot but instead it is a joint that has limited mobility anyway (her pastern) so it hopefully will not affect her too much. When Alice and her Mum visited Bess today she was out of plaster and seemed very happy. She was a little sore on her bad leg but that is not really surprising considering it is only a month since she damaged it so badly. This weekend there will be a sponsored bike ride to raise money for Bess. We will be looking after all the horses without using any cars! This means we will have to cycle a long way between the chase and the home field and we are hoping to make it to Rowney Green too! Please sponsor us as we still have a way to go to pay for this vet bill. The clinic rang us today to tell us that Bess' operation was successful. Bess woke up well from the anasthetic and seemed to be much more comfortable on her bad leg. We are all delighted at this news although it does mean that we will now have to start paying the vets bills!!!!!! We will recieve the bills from the clinic shortly and our vets will soon work out their costs so we should start to get more of an idea of how expensive the whole thing should be. Many thanks for all the fund raising that is going on as it has helped so much.